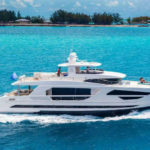 The motor yacht TRENDING is offering a 15 percent discount on all remaining availability in February and March in the Caribbean. Rate: from US$ 200,000 per week less 15% discount. Plus all expenses. 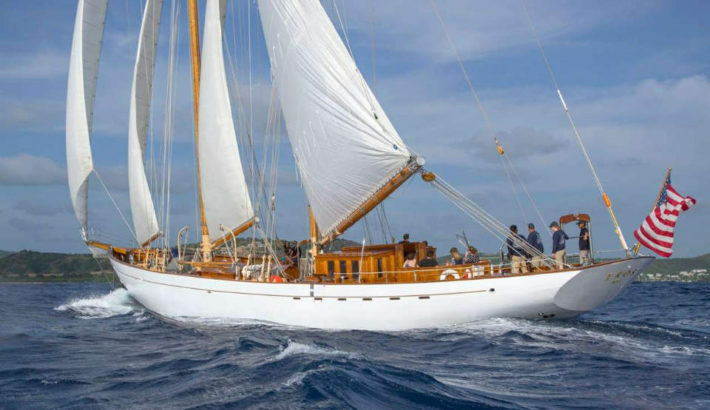 EROS – 103ft (31.4m) vintage schooner – an excellent choice for a classic yacht charter. 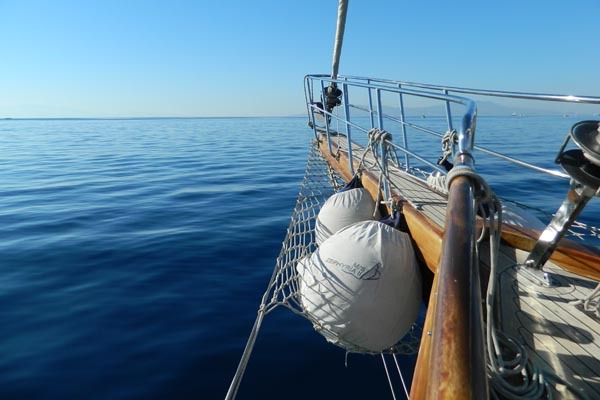 Step back into history and experience gracious sailing on the vintage classic yacht EROS – acres of sail and miles of lines, teak decks and varnished rails and woodwork. She was built in England in 1939 and has had an adventurous history. This summer her adventures are in New England where she is available for cruising charters and for regattas. Then for the winter she will be back in the Caribbean, based in Antigua and ready for charter. 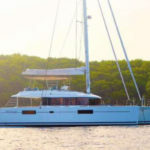 EROS can accommodate up to eight guests in four cabins and has all the modern facilities including air conditioning. 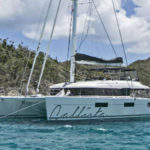 Her Caribbean charter rate is from US$33,500 per week + all expenses. We had the most amazing time and miss our days floating about Antigua so very much! We had great weather (one dodgy day) found some great restaurants with the help of Wilson!! 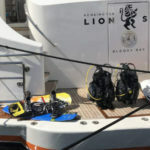 Fantastic snorkelling and all in all a wonderful holiday. Eros was delightful and we felt very honoured to be aboard. Arriving at Nelsons Dockyard and seeing her there was really special – she is a fantastic boat. All the crew were excellent – Wilson and Kelly, Erica, captain Jeremy and chef Adrianne – they all looked after us beautifully. 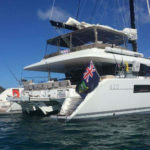 British Virgin Islands Yacht Charter Update….. 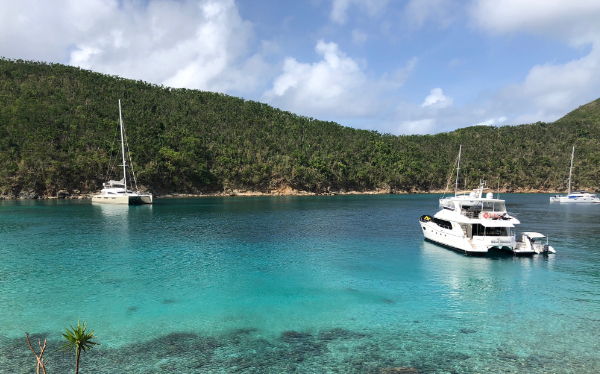 They are not in the news anymore, but I wanted to bring you a BVI update about chartering in the Virgin Islands this year. After the destruction caused by last year’s storms there has been a massive and spectacular recovery. Many of the smaller and uninhabited islands were ready for visitors by Christmas – the beaches were cleared of debris and the vegetation sprang up very quickly. 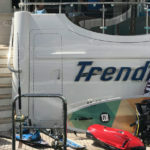 Since then the recovery has only gained in pace with re-openings of famous haunts and clearance of popular bays. I’ve been speaking to crew who are currently in the Virgin islands for their comments. Jenn Hart aboard the 60ft power cat SEA BOSS, says beaches are now looking great and most of the usual spots are up and running. Although the resorts at Peter Island, Little Dix, Saba and Bitter End are still closed, rebuilding is under way. Jenn says she would definitely add a day trip to Oil Nut Bay as a new feature for charterers. Guests can have lunch, order drinks in the swim up pool, sail Hobie-Cats, kayak and paddle board off the beautiful and exclusive shores, all the while enjoying the red-carpet treatment rolled out by the excellent staff. On the topic of dive sites, I’ve been in touch with Jerry Blair, an experienced diver and Captain of the 62ft catamaran COPPER PENNY. He said that while some of the sites had been damaged you are still spoilt for choice as there are so many excellent sites. The fish are still there, the turtles, the stingrays even the lionfish. He said that last week he was swimming for an hour with two wild dolphins near the Baths. The BVIs are also known for their bars. The legendary floating bar, Willy-T or Willy T3 as it will be known has just opened in its new location – Great Harbour, Peter Island. Other famous bars such as the Soggy Dollar and Foxy’s both on Jost Van Dyke are open and in full swing. Rebuilding has started on Bitter End Yacht Club on Virgin Gorda. And there are dozens more, ready to welcome guests. Anegada was fortunate in that it escaped the full force of the storms. As a result, most of the hotels and beach bars were quick to open including the famous Cow Wreck Beach Bar. The low-lying Anegada is famous for its beaches and Caribbean lobsters. Tortola, the main island in the BVIs was really devastated as you might have seen in TV coverage just after the storm. Nearly a year on there is still a massive amount of rebuilding taking place, improvements too, but businesses and shops are open and getting back to normal stock levels. Provisioning for yachts is excellent. And what of the boats and crew? 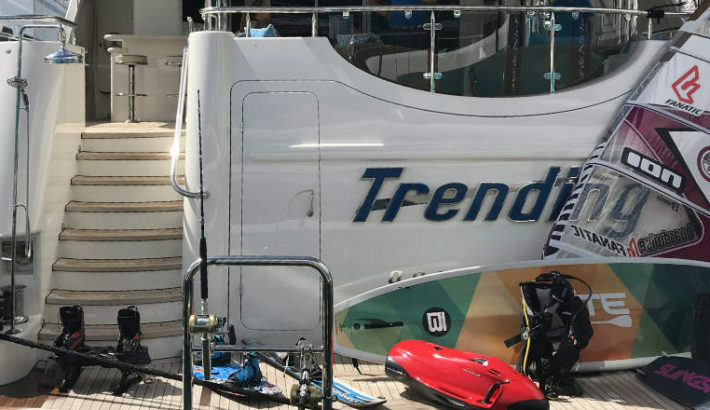 Some boats were lost, sadly, but this has made room for some stunning new boats which I hope to be seeing later this year at the Tortola and Antigua boat shows. Some crew have retired but several of my old friends are back on new boats and continuing to be the perfect hosts as ever. 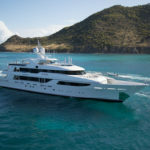 The vast majority of yachts however, which charter in the Virgin Islands during the winter season were out of the area at the time for the storm season and so completely safe. Last winter some of them chartered in other areas of the Caribbean such as Antigua or the Grenadines which were untouched by the storms. More yachts will be back in the Caribbean this winter such as the stunning OHANA, a 163ft superyacht and dozens of large motor yachts. If you would like some recommendations for your winter yacht charter holiday, we’ll be happy to help. A dazzling area of strings of sub-tropical islands stretching between the depths of the North Atlantic and the east cost of Florida, the Bahamas comprises more than 700 islands. Many are uninhabited and most are fringed by coral reaching out to deep waters, creating that striking contrast of shades of fabulous blues. 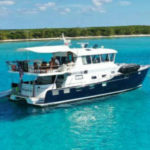 A yacht charter in this area could start and end in Nassau which is convenient for flights, but a one-way trip starting in the busy and commercial Nassau would allow you to explore more of the reefs, beaches, dive sites and historic towns of the Exhumas, one of the principal island chains. And an exciting end to your yacht charter could then be the seaplane back to Nassau. 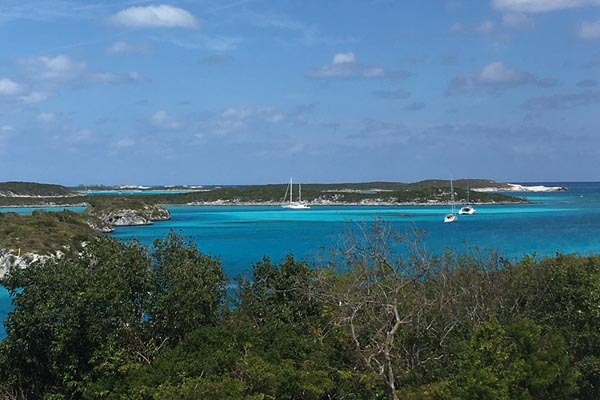 Yacht chartering in the Bahamas is dominated by motor yachts, although there are some excellent, shallow-draft, sailing yachts. For recommendations, please get in touch. THALIMA – a 33.7m performance cruiser from Southern Wind Shipyards. She’s the first in the new SWS 110 series designed by Nauta for high sailing performance to combine relaxing cruising and exciting sailing. THALIMA has a modern, spacious and bright interior achieved with a choice of premium materials, colors, shapes, and light source. The décor is simple yet with an elegant contemporary edge and a welcoming atmosphere. Her accommodation, for up to eight guests in total, includes the master cabin, a double and two twin cabins. “I am not known for brevity, so this will be comprehensive. The short summary is: WOW, loved the Cuan Law and the BVI and you may add every superlative you can think of! My husband had planned this trip to celebrate my 60th birthday, and invited 18 friends to join us. I was mildly alarmed when I learned of the plan (20 of us, on a boat, for a week??!!) and I must say that every facet of this trip FAR exceeded my expectations. I am a pretty positive person, but people called me to express their concerns: would they be seasick, they don’t dive, or even generally like being near the water, would there be enough room for everyone, how would the food work with everyone’s different tastes, would there be enough to do, would there be too much sun, etc. etc. And this is why I wanted to write a review. To reassure anyone considering spending time on the Cuan Law that you are in for a real treat. The Crew – I know there is some fluidity with the staff (although our outgoing captain had been with the Cuan Law for 15 years, and several other crew members for 2 or more years) so I can’t guarantee who your crew will be. However, what we experienced is likely to reflect the “corporate” culture – which was a group of people who were competent, FUN, helpful, ACCOMMODATING, had great attitudes and were all around quite wonderful. There was a strong camaraderie among the staff and a genuine warmth that was palpable. There is no doubt that they contributed in a huge way to everyone’s excellent adventure. The Boat – I don’t have much of a frame of reference to compare it to, but the space was extremely well designed and lent itself to a lot of interaction. There were no lack of places to be out of the strong Caribbean sun. The trimaran is a STABLE vessel, and we hugged the coast among the British Virgin Islands. We were not in the open ocean and everyone remarked at how well they slept (with the boat gently rocking in the water.) The boat was ship-shape clean and seemed quite up-to-date. Cabins were plenty large and beds were comfortable. The Itinerary – We had a range of interests and water skills and all were happily addressed. The divers dove, those seeking certification were well taught, the snorkelers had plenty to see every day (including the Wreck of The Rhone! ), those who wanted beach time had plenty of private, white sand beaches to enjoy and water sports were available too (water skiing, tubing, sailing the Hobie Cat, kayaking, etc.) I think we took advantage of everything that was offered. Most days included a hike and for those of us who went on those, we were richly rewarded with outstanding views. The captain re-arranged our plans (on his own) so that one couple who had to depart early were able to join us at The Baths on Virgin Gorda. SO APPRECIATIVE that he did that. And when our friends learned that they had to be home on Wednesday night, mid-trip, plans were made to get them to Beef Island, to catch a flight to Puerto Rico, then home. It was seamless. The British Virgin Islands are not overrun with tourists and cruise ships. It is just really chill, gorgeous and in many places, simply magical. Each island, each part of the day, each opportunity and experience was awesome. Food – Creative, home-made options were presented at every meal and every attempt was made to be sure that everyone had what they needed. Truly impressed with what was prepared each day (3 meals AND hors d’hoeuvres) for a full boat and the crew, in a galley kitchen. And not just thrown together – there was serious presentation involved! We received a Questionnaire prior to the trip to make sure that our dietary needs were addressed, and that our goals for the trip were met. Check and check. There are not enough superlatives to describe how happy we ALL were with this unique experience. If you can fill the boat with folks you know (and really like!) all the better. If you are just signing up on your own, I think you will have an excellent time as well. Turkey has a wealth of history and intrigue and the west coast from Bodrum, Marmaris or Gocek is a perfect summer charter destination. Along this coastline of spectacular pine-clad hillsides, sheltered bays and turquoise water, there are many pretty anchorages, beautiful clear water for swimming and water-sports, fishing villages, ancient ruins and archeological sites including Lycian and Greek cities, sunken Roman harbours and crusader castles to explore. Turkey is a cruising destination for many super-yachts, but is perhaps more well-known for the traditional wooden gulets. 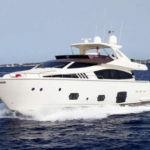 The more recent Turkish boats offer impressive facilities including spacious cabins with high headroom, extensive deck areas and enormously hospitable crew. If Turkey could be a destination for you this summer with your friends or family, please ask for a list of recommended boats. We can provide information on the the cruising area, charter costs and booking procedures.